It’s often said that careers begin at Crankworx and American rookie Dakotah Norton is the case in point. Norton is certainly making a name for himself this year, winning the Dual Slalom presented by Giant in addition to landing in third place on the podium at last night’s Ultimate Pump Track Challenge. The dual slalom track was fast and fierce, forcing riders to lay everything on the line, every single time. The evening was filled with tight match ups and hairpin margins. Norton and, third place finisher Bernard Kerr, were neck and neck in the Semi-Final, with Norton taking the win by a .03-second advantage. Martin Maes showed his true colours, consistently crushing his opponents, oozing style before bailing on his first lap in the Big Final to land in second place. With Mayes unable to race in the second round of the Big Final, Norton dropped in for a victory lap. For the ladies, it appears that three times is the charm for Dual Slalom winner Jill Kintner, who also nabbed a first place finish in 2013 and 2014. 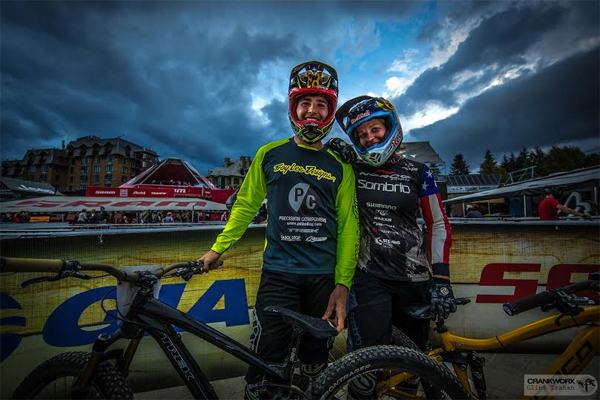 Kintner and the woman named the 2015 Queen of the Crankworx World Tour, Anneke Beerten, went head to head in the Big Final. Beerten delivered two solid laps, but in the end Kintner came out on top. Beerten has yet to receive her Queen of the Crankworx World Tour title, however, the announcers let slip it is now impossible for anyone to catch her, given her 250 point lead over her nearest competitor, Kintner.